First work out what color you want your walls to be. If you have read about the 60-30-10 rule for interior design you’ll know that the walls will fill the majority of your color needs (i.e. the 60%). Typically for an office you would go for a neutral color such as beige, white, or off-white tint for your walls. Why so boring? It makes the ’30’ and ’10’ accent colors pop out more. You are much less likely to have existing furniture that clashes with a neutral color. Offices tend to be conservative places, and if you are renting you might not get permission to go wild. Workplaces are often mixing a diverse bunch of people together. A room with four red walls might feel energising to you, but to others it could be tiring to spend day after day in there. Of course there is always room to break the rules – but we will leave that for advanced decorators. There is so much variety available in office equipment these days you are sure to find accessories in the color you want. After the ’60’ and ’30’ are worked out, now find that last 10% to complete the set. This can be something as simple as a piece of artwork, a glazed pot for a pot plant, a chair, or whatever one-off piece you can find that offsets your primary color and your bold offset. You might have a column or other odd building feature in your room that you can paint a different color to the walls. It doesn’t really matter what color this item is – at only 10% (or less) of the office color scheme you are pretty safe whatever you chose. An multi-room office with all rooms painted the same color looks monotonous regardless of which color scheme you choose. 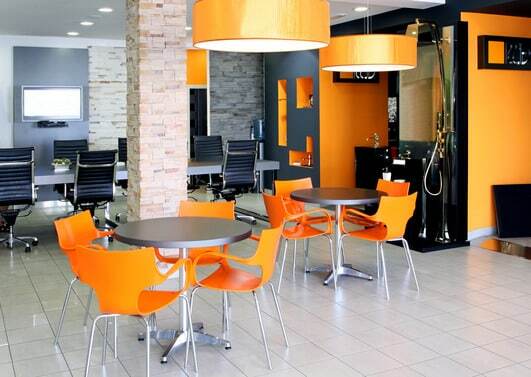 You don’t want to look like an bland corporate office that was painted by numbers, do you? Mix it up between rooms and give different vibes. Use brighter colors for socialization and eating areas, receptions and boardrooms. Tone it down a little for private offices. Quiet areas such as libraries and chill-out zones suit darker tones. Don’t forget to give office staff the opportunity to introduce their own favourite colors. After all, it’s their office. Even a color-blind individual (literally or figuratively) can create an interesting and invigorating color experience for a small office. Looking for more decorating tips? 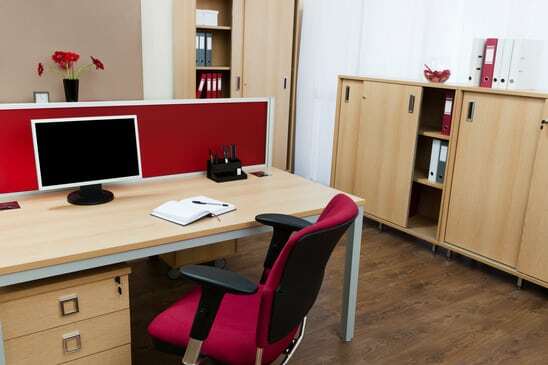 check out our Five and Five More Decorating Tips For A Small Office. Did you recently repaint and redesign the office colors where you work? Let us know what colors you chose and inspire others!